and all the time I keep on loving you. which time can rend apart. I keep on loving you. Premananda writes: "Tonmoyananda" is my brother, Frank Morgan, a musician and painter who is also one of my best friends. When Baba made his first visit to America I had a great wish that Frank would come and meet Baba, and my wish was granted. He came to Brooklyn to see Baba, and later came to the Bhakt-Gnana Yoga Ashram in Harriman, NY, where Baba was staying for a few days. 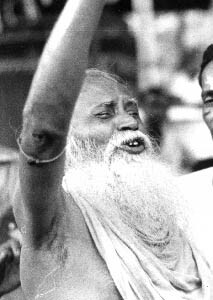 He sang several of his songs for Baba, and seeing that Frank became totally absorbed in his music gave him the name "Tonmoyananda" meaning "absorbed in bliss."